Places with a high density of beer-makers are also more likely to vote Democratic. Do they hold the key to Obama's reelection hopes? 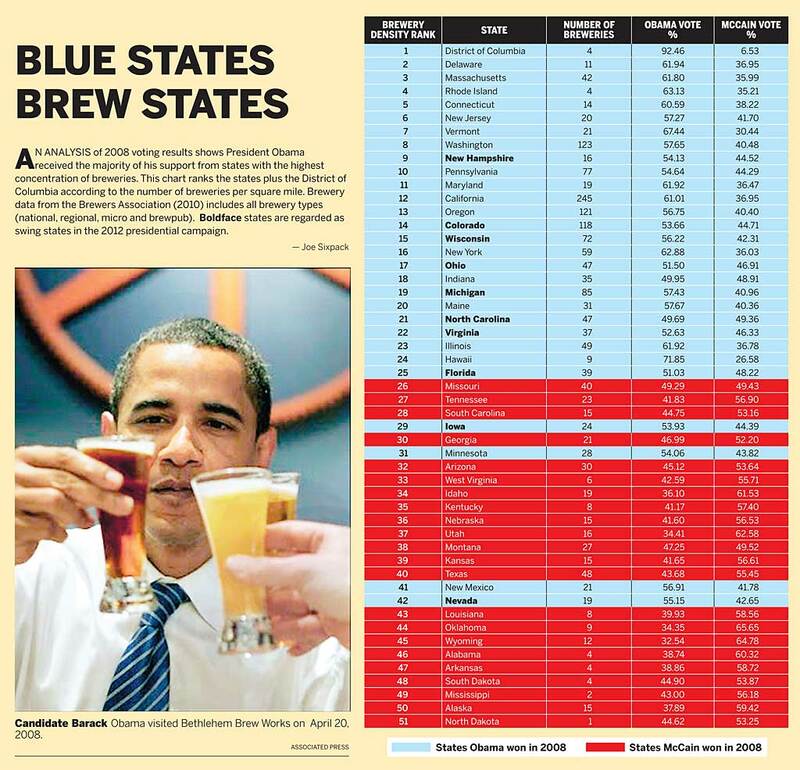 As you can see, the correlation between states that went for Obama and states with high density of breweries is incredibly close. Now, remember the old "wine-track voters vs. beer-track voters" narrative from 2008? According to that idea, Hillary Clinton was the choice of working-class High Life and Coors drinkers, while Obama was the choice of merlot-sipping intellectual poseurs; Democrats worried that might sink Obama with white-working class voters (and it's true, he did poorly among them). This graph doesn't really do anything to disprove that: Beer consumption has no discernible effect on voting, with McCain and Obama splitting the top 10 ale-adoring states. Consider that craft-beer drinkers, according to demographic studies by the Nielsen Co. and others, are mainly white and male. It appears the Obama campaign is trying to trim the president's voter gap among white males by targeting craft-beer drinkers. He points out that the owner of Alexandria, Virginia's Port City Brewing spoke at the Democratic National Convention. And the White House recently released (though under Reddit duress) its special house beer recipes. The Obama campaign has repeatedly gone out of its way to link the president with a beer -- apparently suggesting that he's more relatable for the average voter than Romney, who does not drink because of his religious beliefs. I suspect in this case that the demographics are a bit more complicated than Sixpack paints them -- what we really need are statistics on craft-beer drinkers' income or education. While it's true that Romney leads Obama among men, the president's biggest weakness is non-college-educated white males. At the risk of stereotyping, these probably aren't the guys who are likely to relax with a Brooklyn Chocolate Stout or the latest 240 Minute Dogfish Head IPA -- they're mass-market beer drinkers (there's a reason Obama sipped a Bud at the infamous beer summit). Craft beers are a more pretentious pursuit -- the type enjoyed by wealthier white males, people like John Hickenlooper, the brewer-turned-Democratic governor of Colorado. We'd need more data on the demographics of doppelbocks to know for sure, though. The brewery density vs. Democratic vote scale is also interesting because there has frequently been a libertarian streak to the craft beer world -- especially for hoppy beers. Because India pale ales have high alcohol contents, they've sometimes bumped up against laws that limit the percentage of alcohol a beer can have. Also curious: What explains the low-brewery-density states (Iowa, Minnesota, New Mexico, and Nevada) that went for Obama? Nevada and Iowa could both conceivably swing Romney in 2012, so 2008 would be an anomaly, but we'll raise a glass to anyone with convincing theories on New Mexico and Minnesota.